The swimming tournament takes place in the swimming pool of S&R Rozebroeken. With an Olympic pool is 50 meters long and 2 meters deep, the accommodation is perfect for competitions. There are individial and team disciplines. The year of birth ( not the date) defines your category. 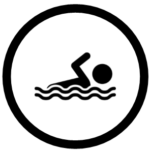 The rules of the Internation Swimming Federation apply.